Fadi graduated in 2018 from Macquarie University after 5 years of study, completing both Bachelor and Master of Chiropractic. Having commenced his education in health science, Fadi soon entered the field of Chiropractic in order to gain a more in-depth knowledge of manual and hands on treatment. 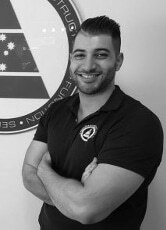 Fadi has been part of the Sports Medicine Clinic team since 2015, as a chiropractic assistant, working closely with Senior Osteopath Doctors in both Peakhurst and Parramatta clinics. This has enabled him to blend both Osteopathic and Chiropractic treatment Techniques to produce his unique and effective treating style allowing him to quickly build a patient list. His history of participating in various sporting activities from a young age, such as football and basketball have also helped him connect with patients. In his teens he got into general health and fitness, quickly fell in love with the benefits and decided to use his acquired knowledge to help people choose a better lifestyle. This has enabled him to have a direct understanding of the effects of sport related injuries on the body as well as general wear and tear as an impact of daily activities and occupational habits. Fadi also qualified in dry needling and has gained his certificate in first aid. Fadi enjoys spending time with his wife Vanessa, who together, are expecting the next addition to their young family in 2019. He continues to enjoy strength training but is struggling to reconcile this with his love for burgers and ice cream. We share in his struggles here at the clinic.